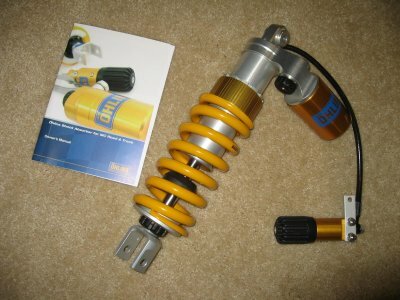 Ohlins has sent me a rear shock for the C14 to do testing on, and I hope to install it tonight or tomorrow and start testing it. I'll let you know how it progresses. I believe that COG is going to raffle it off at the National rally in Vermont this summer. I've made a gallery showing how to remove the OEM shock as well as showing the install of the Ohlins rear shock. The service manual leaves out a step for removing the rear shock. You need to remove the lower bolt for the tie rods so that they can hang down free out of the way. If you don't do this, you won't be able to drop the shock out the bottom. If you're installing an Ohlins, you'll also have to remove the muffler, cause the only way it can go in is from the right side, and the muffler is in the way. You can install the OEM shock without removing the muffler, but the Ohlins has a large reservoir on it that complicates installation slightly.